Am I a climate change crank? Possibly. I put my climate change work ahead of everything except my marriage (and my dog ;-). I put off friends if I've got a writing project on the go. I can't bring myself to attend social events that are going to be all happy happy. My house is a mess. I don't believe that "hope" is more important than action (but that action is our only hope). I rarely see my family "back home" because I don't want to fly. My social media posts are almost always about environmental issues (although I'm not averse to a joke or inspirational story now and then). And I can't remember the last time I got to go on a "real" vacation that wasn't a climate change conference (and the attendant stresses). Yeah, maybe I am a climate change crank. But it's how I can live with myself. It's how I know I'm doing (almost) everything I can. However, as more and more people discover how bad things are, they are talking more and more about their despair ... the despair I've been feeling for years and years, and crying about every. single. day. So in the interest of keeping some friends in my life, I'm not going to say, "What took you so long?" or anything snarky like that. However much I believe that truly feeling the pain of what we're losing and then lamenting it is vital, I'm going in a different direction today. Even when scientists uncover new information about the impacts that will result from climate change, even when the research tells us that we have only a few years to make global changes if we’re to avoid the worst, here at Climate Reality we remain optimistic. We each, as individuals, keep our hope tanks filled in different ways, but here are five things we’ve found to be particularly good for refilling our optimism. As a climate advocate, you’re likely tuned in to the latest research and policy progress regarding climate change…and so it’s not news to you that the headlines aren’t always sunny. Many people who contemplate climate issues find that they wrestle with a whole spectrum of emotions – including, for some, grief. And it’s no wonder. But the five stages of grief end with acceptance, and there are many wonderful activists, researchers, and medical professionals working today to help people who are working through environmental grief to reach the acceptance stage and stay motivated. There is great power in acknowledging and talking about the feelings we have about the climate crisis – and accepting our own feelings is important if we’re to turn acceptance into powerful action. The best antidote to despair is a community of people you can talk with, learn with, and work alongside to make a difference. When we meet directly with the people who make up the Climate Reality Leadership Corps – parents, teachers, doctors, scientists, innovators, entrepreneurs, community organizers, faith leaders, and so much more – we find at every turn that there are new reasons to be optimistic. Did you know that just last week members of a US Climate Reality Chapter in Santa Barbara worked together with the students in a Campus Corps Chapter to get their local transit district to commit to using all-electric buses? This community of passionate activists met together, campaigned together, and ultimately won together. And this singular accomplishment doesn’t exist on its own – take it from those of us who see your Acts of Leadership come in every day. Thanks to people coming together to support and inspire each other, change like this is happening right now in places all over the world. "In the struggle between hope and despair, I always come out on the side of hope." It’s not too hard to find inspiration in the work of Climate Reality Leaders, but where else can you go for a quick dose of hope? The bad news often grabs the big headlines, but it continues to be true that in spite of attention-getting policy setbacks at the national and international level, the economy continues to turn in favor of clean, renewable energy. For instance, we just learned that in some parts of the US now, wind and solar are cheaper than coal and natural gas, and the We Mean Business Coalition now boasts 830 companies committed to significant climate action. Companies, as well as local governments, continue to prove they can make big changes. Cities, which are responsible for approximately 70 percent of global carbon dioxide emissions and a place where policies like building codes and renewable energy standards can make a real difference, are stepping up in a big way – in fact, 27 major cities (including London, New York City, and Melbourne) have succeeded in reducing their emissions by 10 percent over a five-year period. Back in 2016, Vice President Al Gore explained some of the many inspirations for his optimism in a popular TED talk, most of which still apply today. The truth is that the news isn’t all bad, even if it may seem that way sometimes – and we’re consistently inspired by the real world progress that we see beyond the doom-and-gloom headlines. Knowing the reality of the climate crisis is important – and we must see it for what it is before we can hope to fight it. But without hope and inspiration, it’s hard to maintain the will to act [this is where I disagree; I think that if we act, it maintains our hope and inspiration; otherwise, it's a cop out, but then I did say that I'm a crank! but just because I'm a crank doesn't mean I'm wrong] – which is one reason why Climate Reality continually looks to highlight and support the solutions that are already underway to fight the climate crisis. 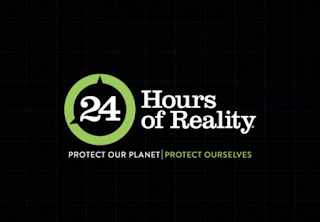 If you want to be inspired by how people all over the world are taking action, make sure you tune in to this week’s broadcast of 24 Hours of Reality: Protect Our Planet, Protect Ourselves. We’ll highlight stories from around the globe not just about the impacts of climate change, but about the solutions that are already gaining ground. We’ll also share a unique way you can take action by contacting world leaders. Watch 24 Hours of Reality live at 24hoursofreality.org on December 3-4. One way we like to recharge ourselves is to get out in a natural place – get close to the very environment we’re all working so hard to protect. Whether you head to the beach, forest, mountains, or local park, the simple act of being outside has numerous physical and mental health benefits. Consider, as well, taking a break from the news and the science for a time. Consider disconnecting from social media or any other distraction that doesn’t directly contribute to your happiness and wellbeing. Whatever it is you do to care for yourself, make sure you make time for it. Often, taking a break from the action to pause and appreciate the life we have on this planet is just the thing needed to allow us to come back refreshed and ready to make change. This fight won’t be over soon, and it won’t be easy – but if we look out for ourselves and each other, if we focus on sources of inspiration and opportunities to act, we can make a positive difference in the future that the next generation will inherit. That is my gift of compassion to you this week! May you find a place in your heart where you can hold the pain so that young children don't have to. I am at the action stage. We are the "Architects of the Future"